Huda Village in Nyamo Township, Samdrutse District lies more than 30 kilometers along National Highway 318 from the city of Shigatse in southwest China's Tibet. "Planting trees is also thinking about future generations"
Speaking of the changes that have occurred in Huda Village over the last 40 years, 66-year-old Party member Tashi Tsering told reporters that there were not so many trees in the village before. Both banks of the Yarlung Tsangpo River were bare. Back then, fuel was scarce, so people wouldn't wait for the young tree saplings to grow; they were instead used to fill stoves. Spring is the season when everything flourishes, but in Huda Village, most people were afraid of spring. Located in a windy area, a gust of wind would kick up sand till it filled the sky, people's homes, and fields. "Back then, the whole village dreamed that one day we would plant lush green trees which would shelter us from the vile sand," said Tashi Tsering. In 1998, the state proposed the "West China Development" strategy, and Tibet, as a nationally important ecological security barrier, received much attention. Village cadres such as Tashi Tsering picked up a shovel and went to the edge of the fields in the Yarlung Tsangpo River Valley and began to plant trees. "I didn't expect that after two years, the ecological benefits would start to appear," Tashi Tsering said. "The crops in the field would no longer be obliterated by the wind and sand. At the turn of spring and summer, the trees were green and birds came." Taking everything in, Tashi Tsering feels glad in his heart. In the new century, the Tibet Autonomous Region also proposed the "Two Rivers and Four Streams" afforestation project. Planting trees has become a conscious action for the whole population. "We don't just think about ourselves, but also future generations!" This year, old Tashi Tsering stopped working, and the burden of planting trees was naturally transferred to his son, Sonam Dorje. "We are growing an oasis together"
Since the 18th National Congress of the Communist Party of China (CPC), the CPC Central Committee, with Comrade Xi Jinping as its core, has attached great importance to the ecological protection of the Qinghai-Tibet Plateau, and a series of important directives have been made to protect the ecological environment of the plateau and Tibet, providing an action guide to ensuring a good ecological environment in "the last pure land in the world". In 2017, under multi-party financing from Aid Tibet cadres from East China's Qingdao City, 1.2 million yuan (0.17 million US dollars) was collected to built a 200-mu (1 mu = 0.165 acres) seedling base for Huda Village. Tashi Tsering encouraged his three sons to fully participate in the construction of the village's nursery base. "Afforestation is a public welfare undertaking for the village. We are all happy to participate, and the Aid Tibet Fund has also sent us extra salaries," Sonam Dorje told reporters. In just a few short months, on the southern hillside of Huda Village, more than 200 mu of plateau white poplars stood tall, just like a green wall guarding the village. "The whole village benefits from environmental protection"
To the south of National Highway 318 next to Huda Village, there is a dense park, which is a great place for summer entertainment. In recent years, the Huda Village Party Branch has used the park as another important source of collective income for the village. Booths in the park are rented free of charge to four impoverished households from the village. Kelsang, 48, is one of the beneficiaries. "I used to live in an earthen house. In the two years since I started doing business in the park, I have been able to move to a new house," Kelsang told reporters proudly. In recent years, Huda Village has developed vegetable greenhouses in accordance with local conditions. The fruits and vegetables grown in the greenhouses have become the "greenery growth point" for the village. According to statistics, there are currently 156 families with greenhouses, with an annual output of 225,000 kilograms, and an average increased revenue of 5,708 yuan (822.7 US dollars) per year. In 2017, the collective income of Huda Village reached 1.2 million yuan (0.17 million US dollars). Things like grain and oil processing, cultivation of fruits and vegetables, cement brick manufacturing, construction teams of farmers and nomads, ecological gardens, and a diverse, village-level collective economy have already helped bring the people of Huda Village into the way to become rich. 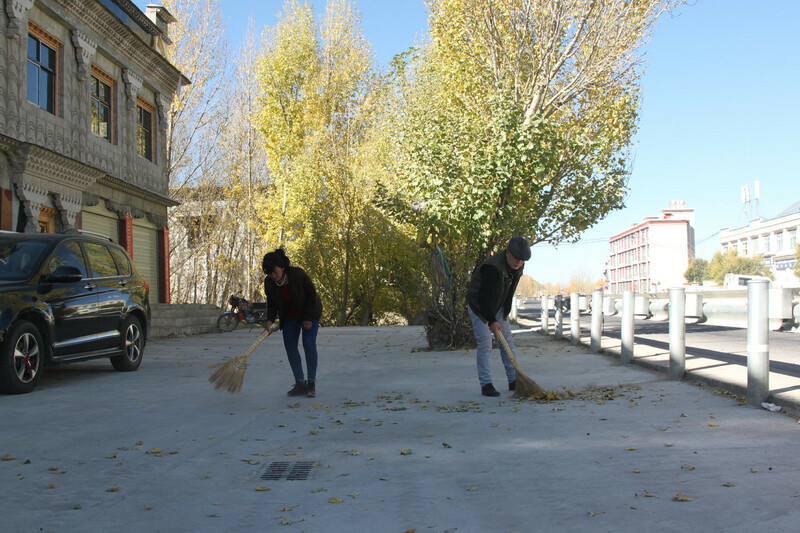 Huda Village has successively been selected as a "National Civilized Village and Township" and "Tibet Autonomous Region Civilized Village and Township". There is a thousand-year-old walnut tree on the southeastern hillside of Huda Village, and it still stands tall. According to legend, when the ancient Indian monk Padmasambhava passed through here, seeing the simplicity of the local people and excellent atmosphere, he then set up his Buddhist practice goal under the walnut tree on the hillside. In recent years, in order to protect the ancient and famous tree, Samdrutse District has built up guardrails around the walnut tree and appointed special personnel to take care of it.